Ever wonder what others think about your blog? I know I do and so does one of our curious reader: Ashii of Beauty for Thought. Ashii is a 20 year old beauty therapist student who loves makeup. 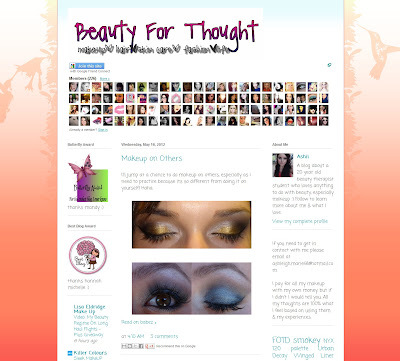 In fact because of her passion for makeup she decided to start a blog to talk about her makeup routine, product hauls & reviews. Follow her to learn more about her and what she loves. -Great "About Me" details. Right off the bat, she lets you know a little about herself and exactly what her blog is about. -Good background. Very pretty pop of color. -Great banner- but it needs some work (see below). -The pictures are gorgeous.. Tutorial is good, but can use a little more details (See below). -Tutorials need more details. I would like to see a step by step tutorial. Maybe add a face diagram to show where you place each shadow color. -Add video tutorials. I think it would be much easier to watch a video than to follow pictures. If you do choose to do videos, you can still show the end result and a mini step by step guide on your blog along with a clip and link of the video. I see many beauty bloggers do this. -Do more product reviews. When I go to a beauty blog I like to know what they use and why they chose it over another product. -Move the follower button to the side bar. I personally don't like it being the first thing I see when I visit a blog. It makes the blog look a little messy. -I know this is very minor, but the banner does not blend well with the background. Fix the banner so it matches the background. I definitely like the blog, Ashii has a lot of great stuff happening.i would definitely want the followers banner on the side, it kind of distracts my eye while moving from the blog title to the top post so I only read it with half the attention. Im ok with the tutorials but yeah video would be great but not necessary. Also the blog roll looks a little messy, maybe only the blogs' names can suffice?Either picture or last post but not both, too much details make it messy. Moving things around would be a great start. Also creating a contact page and even a blog list page would help clear up the main page. Also I'm noticing that the adsense ads are too large for the width of the blog I would either widen the blog layout or make the ads smaller to fit. I like the blog too. It is simple to navigate through. Though it could use a bit of cleaning up. Maybe have all of the about me, blog awards, etc all on one side or creating tabs. And as Ashely K suggested above, create contact page and blog list. Cleaning it up a bit would make the page more attracting. Otherwise, great blog. Thank you so much for the critique! I would love to make videos, however I only have a webcam and a camera that's not the best for videos & not very good lighting. I do step by steps sometimes but to be honest I can only do them if I have the time, which I rarely do as mostly everything is in the morning before work. I will also work on cleaning it up- I can see how it looks messy. The blog banner is something I've had trouble with for a while, I'd love for it to blend in however I don't really have the programs or the know-how to fix it,haha. I will keep everyone's criticism in mind! Thank you.